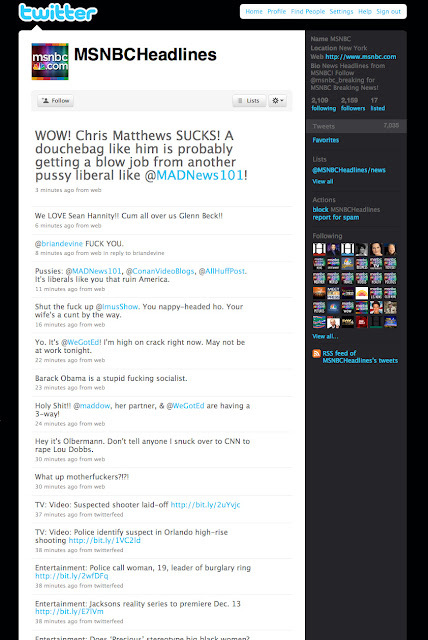 Ashley J George | AD-ventures of a Creative: Just For Fun: MSNBC Twitter gets hacked. Some days there are things that happen that provide just enough entertainment to make your day. Well today, someone or multiple someones hacked the twitter feed on MSNBC. If you missed it I was entertained enough to take a screen shot. I love that you can obviously see they had free reign for half an hour before the feed got suspended. Enjoy! UPDATE: Sadly this was a hoax. . .but regardless . . . it is still entertaining.